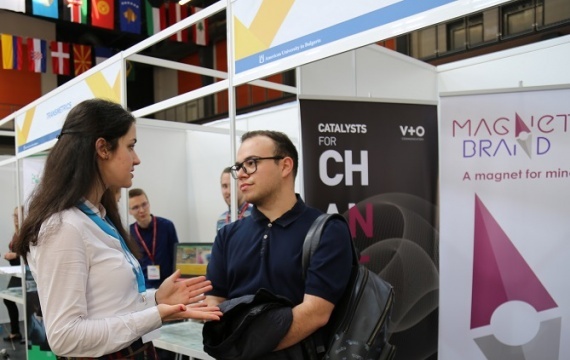 For the 26th year, the AUBG Job & Internship Fair gathered together some of the best employers in Bulgaria and some of the region’s most talented students. Over 60 companies from industries ranging from IT to NGOs to PR attended the AUBG campus April 3. Among them were a number of AUBG alumni, many of whom themselves have landed their first job thanks to the fair and have now returned to Blagoevgrad as recruiters. Karina Khristich (‘18) from Kazakhstan was among the company representatives at the event. “Last year, I was going to AUBG’s Career Fair to try my luck and find a job,” Khristich wrote in an Instagram post. “I’m so excited to come back this year as a recruiter.” Khristich currently works as a Brand Ambassador at Centroida. Established on the AUBG campus and by AUBG students in 2016, the software company now has a team of 50 developers based in Sofia. According to a recent survey, 99.8% of the AUBG graduates receive a job offer or get accepted for a master’s degree within a few months after they receive their AUBG diploma. “I really quickly managed to get a job after graduation, which is one of the fantastic opportunities AUBG provides you with,” said Mario Pinalov (‘18) who now works at telecom company NETERRA. AUBG alumnus Kristian Nikolov (‘16) recently got accepted at the prestigious MSc in Analytics at Northwestern University in Chicago. He will study there on a Tchaprachikoff scholarship— a scholarship fund set for AUBG graduates from Bulgaria who get accepted at a top 20 U.S. school. Nikolov believes that what helped him get there was his solid academic preparation combined with his valuable professional experience at award-winning data analytics firm GemSeek. Just within two years of working there, Nikolov—a mathematics and economics major at AUBG— became the youngest employee at the company to be promoted to a Senior Analyst. How it all started? With an internship at GemSeek Nikolov landed as a student during the annual Job & Internship Fair at AUBG.